Experts in the design, fabrication, testing, delivery and startup of high vacuum distillation evaporators and plants. IPS operates on time, on budget, and on agreed-upon specifications. GIG Karasek, the world’s largest thin film system fabricator, has built thousands of systems and has extensive fabrication capacity of up to 100-ton vessels in just about any metallurgy required, with specific expertise in Titanium and Inconel. As a Toll Processing Manufacturing company, InCon Processing developed technical and service expertise to keep our plants up and running. We use the same process and technical methodology that maintains the systems 24 hours a day, 7 days a week is available to keep your process up and running. IPS can help you design, manufacture and install a plant designed to your exact specifications. IPS is the leader in Wiped Film Evaporators, Agitated Thin Film Evaporators, Short Path Distillation, Toll Distillation, Wiped Film Distillation, Agitated Thin Film Distillation, Monomer Distillation, Polymer Distillation, Vacuum Distillation and High Vacuum Distillation. InCon was selected for the design, build, construction and commissioning of a High Nutritional Red Palm Oil Vacuum Distillation Plant in Indonesia. The plant employed two of the world’s largest Short Path Distillation Evaporators. The InCon Palm Oil Molecular Distillation Process was selected since the process could recover maximum nutritional content in palm oil. InCon can contract manufacture the same High Nutritional Red Palm Oil by molecular distillation in our toll processing plant. Or we can recover any nutritional compound from a biodiesel process. We installed the world’s largest biodiesel wiped film evaporator dryer to vacuum distillation process to recovery pharmaceutical grade glycerine. Using POWERFILM Rotor Technology and InCon’s best manufacturing practice, InCon has shrunk a two-stage wiped or thin film evaporator process to one stage. Savings to the molecular distillation system were 40%. POWERFILM Wiped Film and Short Path Evaporator Rotor Technology has increased capacity by up to 30% when replacing a competitive Wiped or Thin Film Evaporator and Short Path Evaporator. GIG Karasek utilizes Wiped Film Evaporator and Short Path Evaporator technology in their Vacuum Distillation Lactic Acid Process and can offer clients up to 95% recovery of Lactic Acid. This Vacuum Distillation Process can maximize yield, however the final result is often dependent upon limitations peculiar to a client’s specific chemistry. InCon has developed a multi-step process to concentrate Omega 3 Fish Oil to up to 70%. The process employs a staggered array of Vacuum Distillation Rectification feeding a Short Path Evaporator, feeding a second Short Path Evaporator, and a Wiped or Thin Film Evaporator. InCon and GIG Karasek can fabricate Short Path Evaporator, Wiped Film Evaporator, and Thin Film Evaporator Technology in Hastelloy, Inconel, Monel, Titanium, Zirconium or other exotic alloys. In fact, GIG Karasek has been fabricating world class Titanium since 1954. 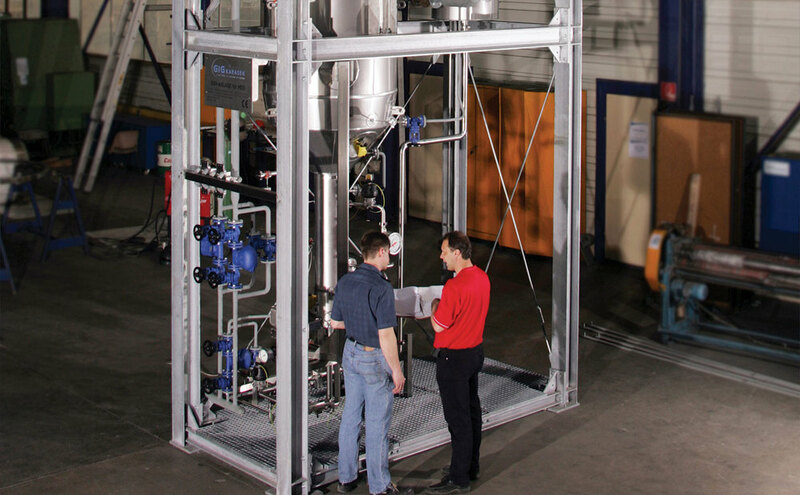 Customers bring their proprietary heat exchanger, column, reactor, and falling film evaporator designs for us to fabricate. InCon excels at providing exacting in house chemical analysis during testing and throughout production. InCon has the developmental bench laboratory analysis to assess feasibility of your process. InCon can then fully pilot and develop your process, using our chemical analysis to maintain chemical specification. InCon can manufacture kilogram to tanker-truck quantities of your product.